As the last smell of spring faded in a flowery envelope at a nearby bin, it was time to bid adieu to Shingo Ogata. I wanted to escape from his loneliness, as if it was mine to hold to; the prospects of designing uncharted ideas somehow enticed me more than Mr. Ogata. Unaware of my goodbyes, Shingo sat in his veranda, greatly immersed in a probability of a possible quarrel between the sparrows and the buntings nestled in the majestic gingko tree. All he heard was the peculiar yet familiar roars of the mountain. Why would he bother about me closing a page on him when he could hardly remember the name of the girl he saw in his dreams, last night. Summer has gone; and the new window did not bring the joy I thought it would. The smell of fresh paint although quite endearing, still made me reminisce my old room. The walls are same but the paint is different, the furniture has changed a bit, and the only old thing in that room besides the clock is me. I wanted to meet Shingo once again. I yearned to dwell in his loneliness, hear Yasuko snore and see Kikuko weep silent tears because of Shuichi. Shingo made me wonder the thoughts that my wrinkles would bring some day. Would my facial creases read out my wisdom or scream my fear of being old and ignored? Will it be egotistic on my part if I let go the roles I play in my family and the society as a whole and for once shine in my individuality? From the very moment a child lets out a cry in midst of a joyous room, it enters a social stage where it plays numerous roles enmeshing the tribunals of life and finally death. And during those performances, behind those responsible masks, a mere human gets lost through the fuddles voices of helplessness. Mr. Ogata gifts these thought to me, when he himself reflects between the possibilities of benevolence, love and sadness. “It was like the wind, faraway, but with a depth like a rumbling of earth..... He had heard the mountain. It was as if a demon had passed, making the mountain sound out”. Shingo, a man in his sixties was still fighting the demons thriving in his life. Although married to Yasuko for decades, he could not bring himself to understand his wife and the marriage in its entirety. His heart belonged somewhere, to someone from his past. A true family patriarch (as seen in many Asian familial cultures), he donned the responsibility of cementing his family and his children’s life to a happy trouble-free structure. Yet, somehow on the path of playing the roles of a husband, a father and grandfather; Shingo stopped searching the true essence of being an individual. Unlike the gingko tree up in the mountain that puts out new leaves in place of its weathered typhoon marred branches, Shingo was afraid of the changes that his life years were bringing in. Kawabata delineates the landscape of Kamakura thriving on the cusp of Japanese modernization and the aftermath of WWII. The old generation makes way for the new and along with the reigning youth comes a vast package of new ideals and life style. The intricacies of arrange marriages that sometimes become more of carried social responsibilities rather than a lovable union. The secrecy of abortion, the pressure of a fertile womb, the pain and anger for a burgeoning fetus in a strange womb and the onset of divorce; was seeping into the traditions threatening the foundation of being a 'successful father'. Shingo finds himself stuck between the “selfish bonds of his blood” and his loyalty to his family when he tries to comfort himself with the ending of Shuichi’s (his son) extramarital affair. Although Shingo’s loyalty was towards his children, he also felt an immense sense of guilt towards Kikuko (Shuichi’s wife), a woman who understood Shingo and his sentimentalities. “In all his life no woman had so loved as to want him to notice everything she did”. Kawabata crafts the relationship between Shingo and Kikuko beautifully on the cutting edge of sensuality and sympathy. Both the characters thrive separately in their miseries and still somehow in a bizarre way find a spiritual connection with each other, making the reader curious for the unheard. At times kindness becomes the nectar that saves from the trenches of loneliness. Maybe, Kikuko’s subtle pampering of Shingo’s needs and a most awaited ear to listen to his dilemmas, in some ways shielded Shingo from hearing the deathly roars of the mountain and marvel at the rows of blooming acacias. “What had been killed by the war had not come to life again. It seemed too that his way of thinking was as the war had left it, pushed into a narrow kind of common sense...."
Kawabata metaphorically symbolizes the ending of the war with the conclusion of old and beginning of the new. With it comes the demise of youthfulness and the seclusion that overwhelms old age. The “ugliness of old age”, the desperate need to find refuge in death , the loss of will to live and the nakedness of dying while being loved rather than living without love ; it is all so disheartening. A reality that is far shoddier from being a mellow isolation. As the novels deepens into the torrid mind of Shingo, one can see the disabilities face by the aging generation with questions looming over them, whether being successful parents with happy families or the illusion of a rearing youth would make them senile or just a divine sanctuary from life’s tragedies. "Turning a Noh mask slightly downward is known as "clouding," explained Suzumoto, because the mask takes on a melancholy aspect; and turning it up is known as "shining, because the expression becomes bright and happy. Turning it to the left or the right, he added, is known as "using” or "cutting" or something of the sort....."Children were precocious in those days. And a real child's face would be wrong for the Noh. But look at it carefully. It's a boy. I'm told that the jido is a sprite of some sort. Probably a symbol of eternal youth". Kawabata symbolizes the embellished Noh mask as the symbol of eternal youth, a facet of life that haunted the characters in this book. One can cheat by dyeing the hair black or plucking white hairs, but as Shingo says, “the ugliness of old age is more horrid than adultery”. In a “marsh-like” arranged marriage where the wife automatically dissolves in her husband’s identity to become one solid societal structure it is sometimes better to “die when you still loved”. Rather than putting Shingo as an operational actor in this novel, Kawabata deliberately lets Shingo’s perception about life and its nuances acts as the protagonists and making the psyche take the centre stage rather than the body. Similar to the solitary crow that descended on a naked branch on an autumn evening, mulishly waiting for spring to come and the great Gingko tree that shoots buds after a stormy night, Shingo Ogata stood tall through all the guilt, responsibilities and skepticism that life bestowed upon him. Comprehending ‘Sound of the Mountain’ is like looking in the mirror. At the very first sight you see a visage generally viewed by people. And as you keep staring at the portrayed image, you start noticing the deep embedded colour of your eyes when it is lit amid the sun rays, the smallest freckle on your forehead, the imperfect mole on your cheek, the tapering end of your mouth that curves when you smile with sheer joy , the lines in between your eyes that deepen each time you frown and lips that are dying to mouth the word “crazy” while you keep staring into the mirror, and ultimately it hits you that the image of your face is full of stories and memories of the past and is never afraid to display new changes over the course of your life irrespective to your struggles to accept it. At first it may scare you, it may saddened you but, at the end it will make you understand the very nature of being YOU. 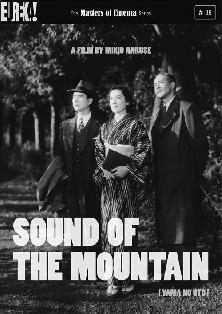 ** Shingo and Kikuko portrayed by Japanese actors in Mikio Naruse aesthetically brilliant rendition of Kawabata's novel.